Anyone remember the Porschari? 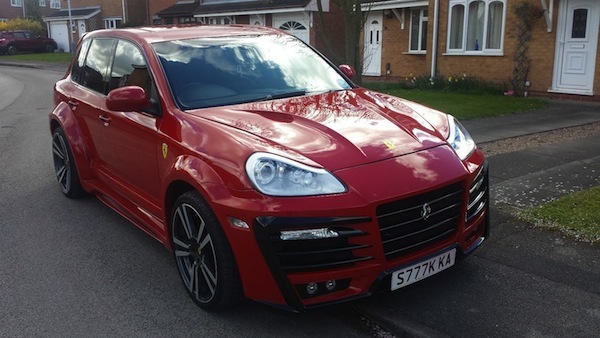 We immediately thought of that abomination when we saw this 2004 Ferrari Porsche Cayenne S for sale on eBay . "I KNOW YOUR WONDERING WHY IS THEIR FERRARI BADGES ON A PORSCHE CAR THE THING IS PEOPLE DONT KNOW WHAT CAR IT IS AND FALL FOR IT THINKING IT IS FERRARI ALONG WITH THE NOISE WHICH PUTS THE 458 ITALIA TO SHAME 😉"
Interestingly, this particular Cayenne has been converted to run on both gas or LPG. If the mileage is true and certain known issues have been taken care of, the car is said to come with a long history of service records, this might not be a bad buy at the right price. However, I'm not sure the body kit and Ferrari badges justify the premium asking price. Simply remove all the chrome and black body kit and convert the badging back to Porsche (which the seller says he has) and you would have yourself a proper Cayenne. Own a Piece of Rock History. Maybe? Ebay Find of the Month.